With sunflower seeds galore! Year-round all weather blend. 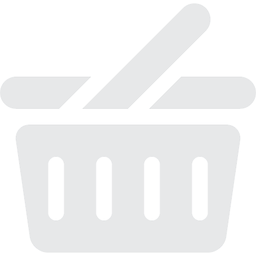 All natural preservative free wild bird foods! Preferred by bird watching enthusiasts everywhere! An all natural blend with real peanuts and raisins. 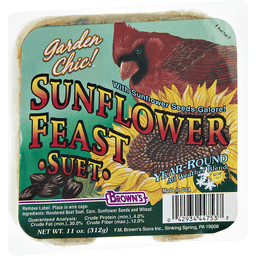 With the premium white safflower seeds that cardinals love! We created Bird Lover's Blend for the experienced hobbyist, as well as the novice. This special blend is designed to attract the most desired birds in all seasons and regions. The experience of five generations has helped the Brown's family to develop this product. We know it will bring the beauty of colorful songbirds into your backyard habitat and make the bird feeding experience fun and rewarding for the whole family. Our Cardinal Buffet blend attracts nature's most colorful feathered friends into your backyard. These songbirds love the best all-natural ingredients that nature has to offer such as Black Oil Sunflower and Safflower seeds rich in fats and protein. Plus, we've added luscious golden raisins and energy-packed peanuts to create a rich blend they'll love to eat. We believe Cardinal Buffet will fulfill all your bird feeding needs and bring into your life all the rewards of this enjoyable hobby. Year-Round High Energy! It's power-packed with high oil and fat content seeds that provide essential energy. There's over 23% fat and 14% protein! A Gourmet Blend! This is not your ordinary bird food! It's rich in the seeds and nuts cardinals crave. 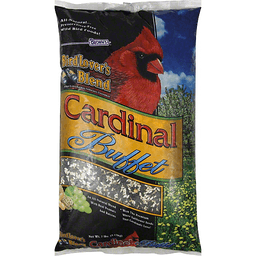 Because cardinals love'em best, we use only premium, white safflower seeds that are seldom included in ordinary bird food mixes. Plus we've added real sun-dried, golden raisins and cracked corn for an added carb boost. Help with the Squirrels! Our blend has a high percentage of white safflower seeds. Birds love them, but squirrels don't like them at all, what a nice benefit! Attracts the Most Bird Species! 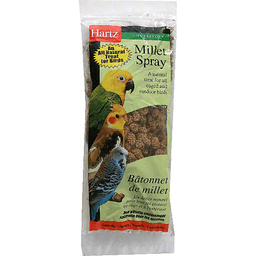 This blend is a favorite of Cardinals, but many other species will love it, too! Pine Siskins, Grosbeaks, Nuthatches, Titmice, Goldfinches, Chickadees, Blue Jays and many more songbirds will flock to your feeder. Made in USA. 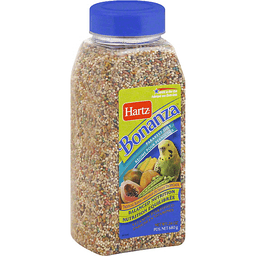 Brown's® Bird Lovers Blend™ Gourmet Songbird. Preferred by bird watching enthusiasts everywhere! A blend with sliced almonds and real apples. 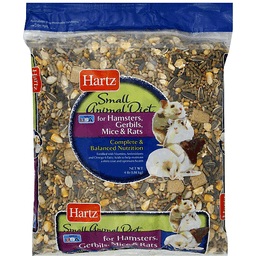 Loaded with oil & striped sunflower seeds & safflower seeds. We created Bird Lover's blend for the experienced hobbyist, as well as the novice. This special blend is designed to attract the most desired birds in all seasons and regions. The experience of five generations has helped the Brown's family to develop this product. We know it will bring the beauty of colorful songbirds into your backyard habitat and make the bird feeding experience fun and rewarding for the whole family. Bringing nature to your backyard. 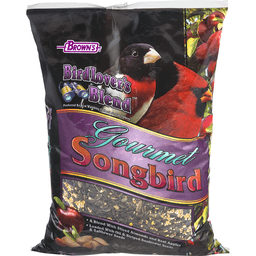 Gourmet Songbird is blended with four types of oil seeds that larger songbirds prefer. Plus we've added almond slices and apple dices that add needed fats for energy that taste great too! Millet and fine cracked corn provide carbohydrates that help fulfill their special nutritional needs. 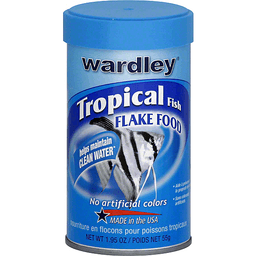 There are no fillers in this blend, just everything they love to eat. Nature's helping hand! This advanced blend provides available sources of proteins, fats, carbohydrates, essential nutrients needed for healthy growth and reproduction. Our super clean, virtually dust-free product is simply a better food source for your outdoor birds. Try these blends too! Brown's waste-free! Brown's nut, fruit & berry. Guaranteed analysis: Crude protein (min.) - 14.0%. Crude fat (min.) - 15.0%. Crude fiber (max.) - 25.0%. Moisture (max.) - 15.0%. When it's more than just a Hobby!®. Year-round: High energy! This is a power-packed blend because of the high oil and fat content in our black oil sunflower, stripe sunflower, sunflower hearts and chips and safflower seeds. Just what birds crave! Plus almonds and apples! We've added sliced almonds, that are high in fat and oils for energy. Plus we've included delicious, fiber-rich apple dices that are an extra treat to entice even the most timid songbirds. Super-cleaned ingredients! We super-clean all of our products to ensure the healthiest blend for your birds. Our all-natural ingredients are what birds love most. Attracts the most species! Our blend appeals to most birds, because we've selected the types of seeds, fruits, nuts and grains they crave. We believe you'll agree it's the best blend for all seasons, climates, and regions. Use in most feeders, however larger songbirds prefer platform-style feeders. Wild bird feeding industry. We support: Barrier bag for locked in freshness. Packed fresh. Consumer help line: 1-800-334-8816. "Click", our pet mouse, says visit Brown's website at www.fmbrown.com. 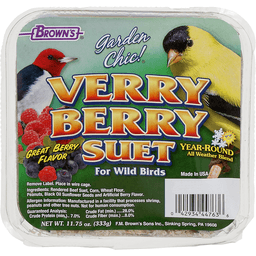 Brown's® Garden Chic® Verry Berry Suet For Wild Birds. Great berry flavor. Year-round. All weather blend. Guaranteed analysis. Crude protein (min) - 7.0%. Crude fat (min) - 28.0%. Crude fiber (max) - 8.0%. Gourmet! Highly prized by cardinals, woodpeckers, jays, nuthatches, juncos, buntings and sparrows. It's better for birds! Each kernel is uniformly cracked into just-the-right-size pieces for easy eating. Our super cleaning process removes unwanted dust debris. Our Gourmet Cracked Corn is not your ordinary cracked corn. 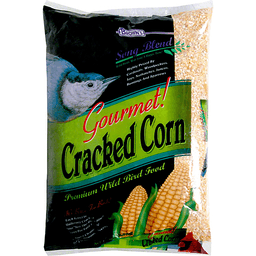 Our select all-natural corn is cracked to just-the-right-size, making it easy to eat for wild birds. These consistently sized pieces are a prized source of essential energy and protein gained from starch and oils. Our five-step, super cleaning process removes the fines, dist and dirt before packaging. 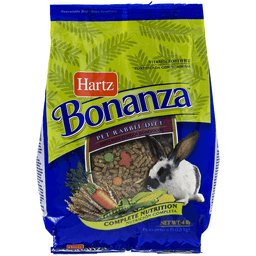 This creates a most desirable, healthy, beneficial and economical food you can add to your feeder program. It's a real lifesaver during stress times. Cardinals, jays, woodpeckers, buntings, juncos, sparrows and nuthatches simply love it. 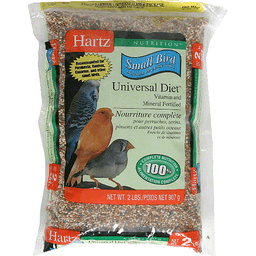 This is a natural source of essential Vitamins A & C that help your backyard birds flourish. It's great decoy! Providing a separate feeder of cracked corn will attract starlings and chipmunks, when placed away from the main feeding station. 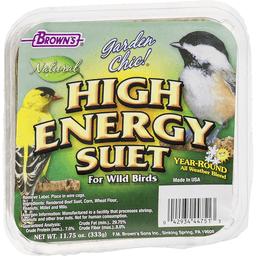 Provide Song Blend Premium Wild Bird products and watch your backyard wild birds sing a happy tune! That's because Brown's is better! After carefully choosing only the best ingredients, our unique Five Stage Cleaning Process removes unwanted foreign matter to provide the cleanest, most nutritionally healthy product available. Our Packed-Fresh packaging process and Barrier Bags then protect long-term freshness and product quality. Whether you are a novice or an avid hobbyist, you'll find Song Blend products will help to make your wild bird feeding experience rewarding and fun! Built in 1843 and registered as a National Historic Landmark, Brown's water-powered grist mill stands on Monocacy Creek in Pennsylvania. The old grist mill remains as solid as the day George Brown built it five generations ago. It functions as a constant reminder of the strength, tradition, and integrity on which our company was built. 125 Years later, Brown's has become a national leader in animal nutrition products. The foundation of the past and the ideas of the present have blended into what we know as Brown's today. Made in U.S.A.